Horrible, right? More people than flowers! 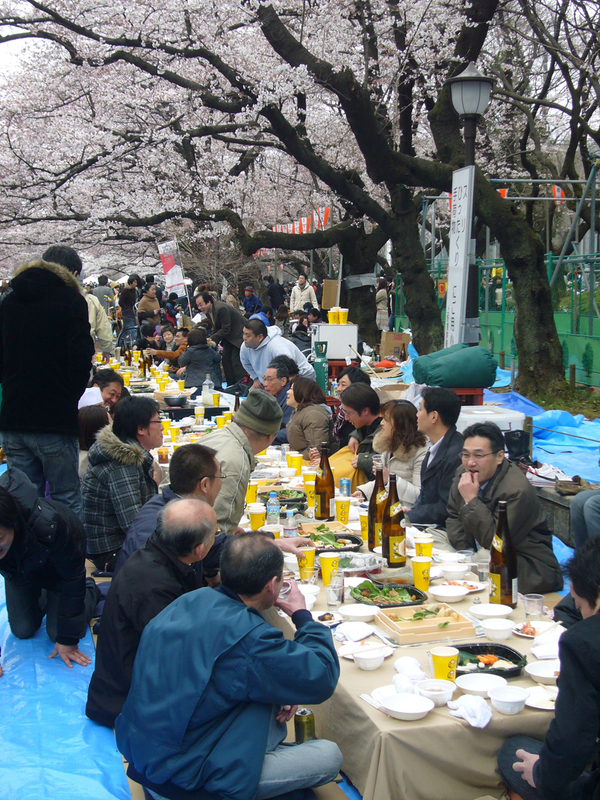 This kind of beer-drinking banquet craziness is common in Ueno Park during The Season. Beautiful, serene and uncrowded! You can only get into this small but lovely garden with a ticket to the museum, but what’s special about it is that traditional teahouses are scattered throughout, and during cherry blossom season they are booked solid by private groups performing tea ceremonies. 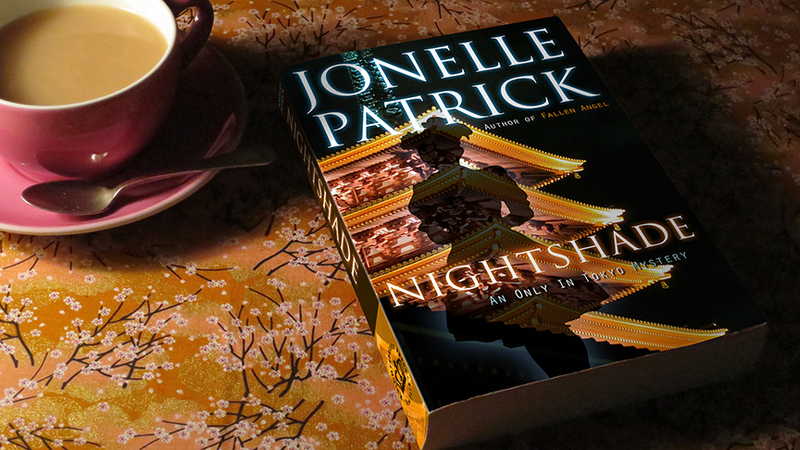 So, bonus points, you also will get to see lots of women in their finest formal kimonos. 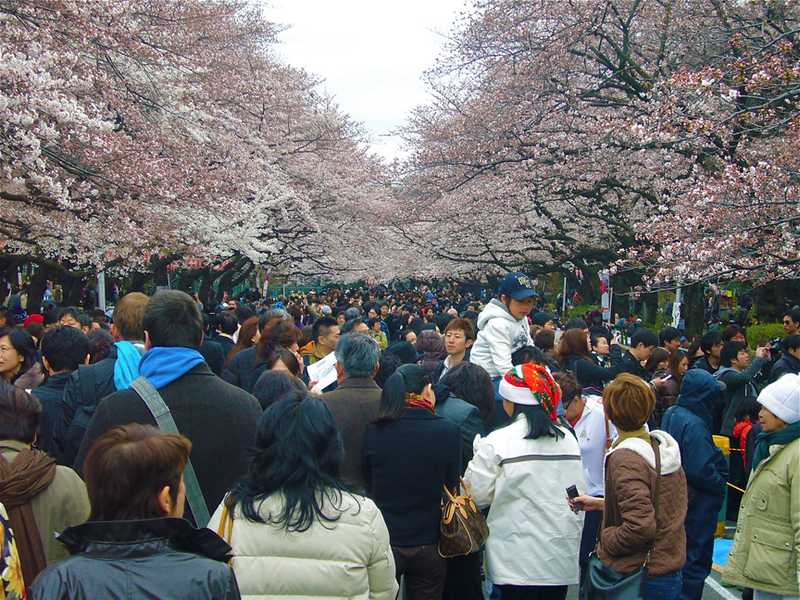 The other hack for Ueno Park during o-hanami is to go at night. They hang lanterns in the trees along the main promenade and the crowds are thinner, despite it being WAY better than daytime. But the Tokyo National Museum is only one of the attractions clustered at the end of the park. I usually skip the other art museums unless there’s an exhibit I particularly want to see, but I can’t resist stopping into the National Museum of Nature and Science to visit the All Things Especially Japanese wing. Front and center are the truly excellent life-size dioramas depicting Japanese of yore. The thing I love about these is that they chose moments in the lives of ancient people and really brought them to life. Although they’re obviously using past-sell-date technology and wearing clothing that’s so last epoch, their expressions and reactions are exactly like people today. 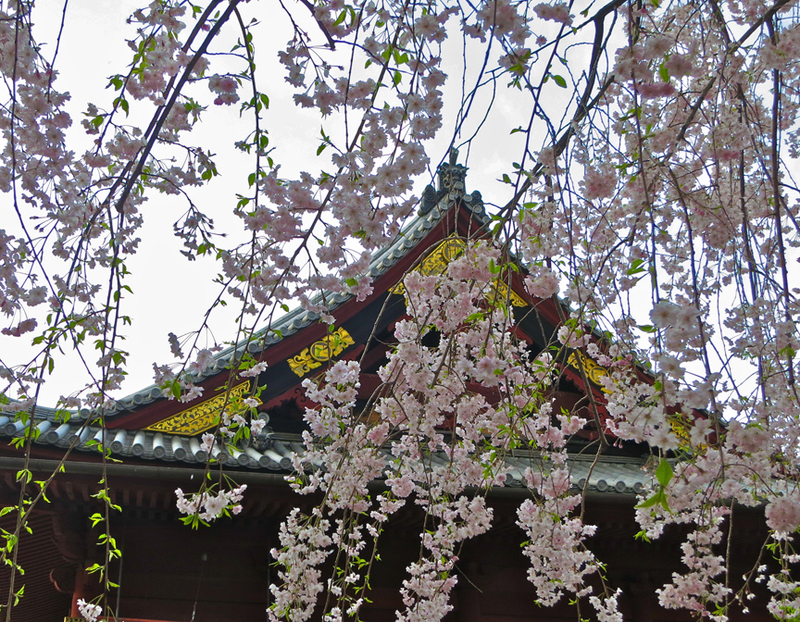 But not all the attractions of Ueno Park cost money – the Ueno Toshogu Shrine is a surprise of a golden bauble with a nice red-and-gold pagoda. And if you’re in Tokyo in late April instead of Crazy Cherry Season, you’ll get to see this. Every spring, the shrine hosts a killer peony exhibit and dahlias, in the fall. There’s also a charming summer festival in July that includes a nighttime parade and floating lanterns on the Shinobazu pond. For this year’s dates, check the Tokyo Cheapo website July events page. And while you’re over near the pond, there’s a charming small museum called the Shitamachi Museum that lets you wander through the streets and step into the rooms of a bygone Japan. 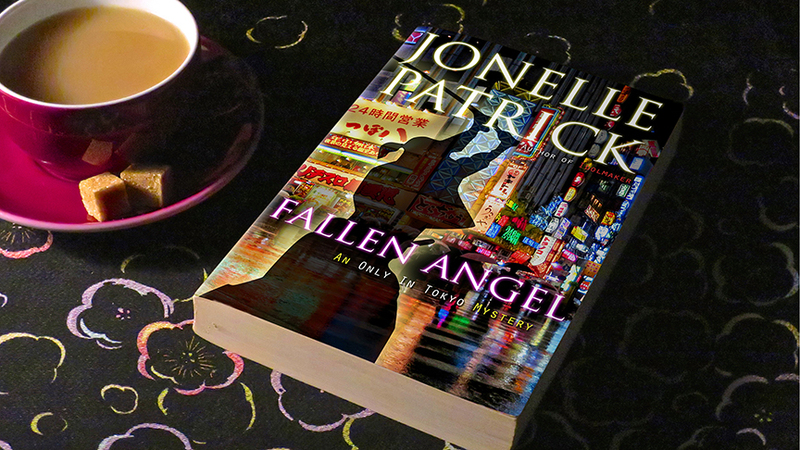 This little timewarp takes you back to the Meiji Era (1868-1912), which is after Japan opened to the West, but before any of the world wars took their toll. And although I wouldn’t usually recommend wasting precious Japan time visiting a zoo, they do have pandas. Open: Six days a week, closed Mondays, on the day after national holidays, and from December 29 – January 1. Open other holidays. Admission: Adults: ¥600, Seniors (65 & older): ¥300, Students (13-15): ¥20, Children (0-12): Free. But you should visit Ueno for this toy store. 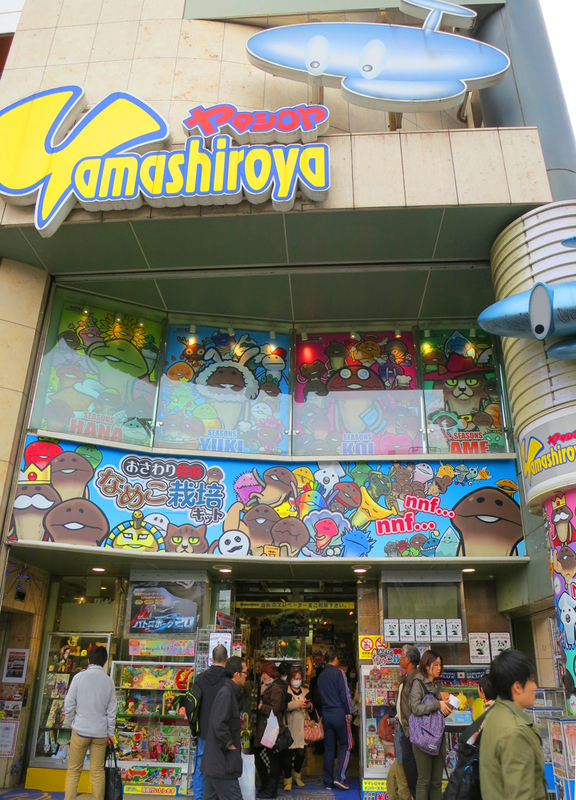 Since the renovated Kiddyland in Harajuku has sadly become filled with international brand goods (I can get Snoopy and Barbie back home, thanks), Yamashiro-ya is my go-to emporium for only-in-Japan toystuffs. …and, uh, stuff like THIS.